As well as developing Bespoke Database Solutions for clients, EasierThan Business Software can also often assist in the support and modification of databases written by another third party, perhaps where that party is no longer trading or you've become dissatisfied with their level of service. Whether created by yourself or a third party, we may be able to help with addition or amendents to your database. 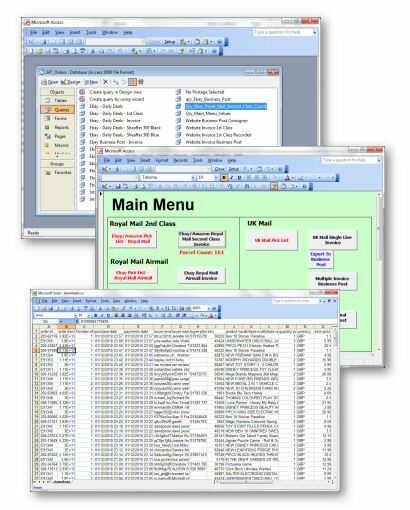 With over 20 years experience working with databases, we can assist with changes to table fields, forms, queries, reports and any bespoke programmed functionaility. If you're stuck with an Access (or other) database that lacks the functionality you require or you've written your own and would like some help to take it a step further, why not Contact Us with the details. In addition, if you have a corrupted MS Access database that crashes whilst running or refuses to read some records or compact properly, we may also be able to help. In the case of Hydes Toys and Gifts Ltd, they'd created their own Microsoft Access database to deal with orders pulled in from various sources. This in-house solution was serving the company well, but there were several things they wanted the system to do which they were stuggling to achieve. The client was looking for somebody to provide the necessary technical modifications, along with an explanation of how they were done. That way they could continue to maintain the database as their own, rather than a managed solution. Due to their location, the work was done entirely via email and telephone. A series of updates were sent to the customer, one at a time, separated by a sufficient number of days for each change to bed in on the live system. Since the initial changes, EasierThan Business Software have worked with Hydes on a number of occasions as the company has grown.